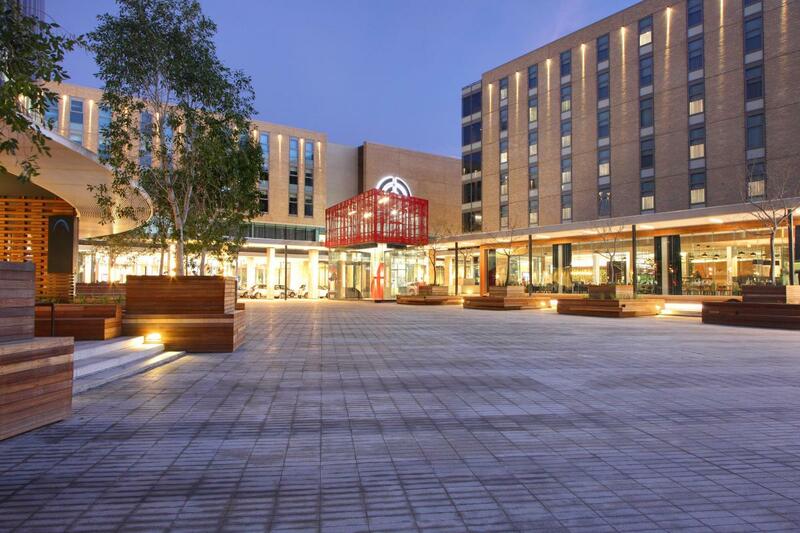 A mixture of facebrick and clay pavers have been used at the vibrant Century City Square, a R1 billion project of mixed-use development that forms the heart of the Bridgeway Precinct in Cape Town. Developed by Rabie Property Group, Century City Square forms the flagship project of the larger Century City development which is significantly expanding the residential, commercial and retail sector of the area. Construction began in May 2014, with completion of the Square set for June this year. The area will comprise a 1200-seat conference centre as well as 12 meeting rooms situated around a business class lounge; a 125-bedroom hotel; The Annex which is 3 500sqm of offices over four floors above the conference centre; The Matrix, a mixed-use building with retail/showrooms, three-storeys of offices and 51 residential apartments covering another three-storeys; The Apex which is an eight-storey building made up of 7 900sqm of offices, restaurants, bistros and coffee shops as well as a six-floor structured parking building and basement parking garage for 1 330 parking bays. Paolo Viotti, director of VIVID Architects, explained that the Century City Square would bring new energy and life to the entire Bridgeway precinct. When planning the development, Viotti and his team opted for the Corobrik’s range of timeless facebricks and pavers, because of their aesthetic qualities, as well as the economic benefits going forward. Some 148 000 Cape Stormberg Travertine, 223 500 De Hoop Red Smooth and 296 500 Natural Earth Travertine facebricks were used in construction throughout the urban square. The Cape Stormberg Travertine facebrick was used as an accent facebrick which revealed and recessed panels, to highlight the ‘floating’ lighter brick facades. For The Apex office tower, which was always seen as a slick, sheer glass façade, Viotti and his team wanted to offset the surrounding buildings in terms of architectural design so facebrick was selected to achieve this contemporary contrast. “The architectural façade treatment and design is one of floating planes of facebrick that is supported off concealed steel angle supports, allowing for the contemporary nature of the design of all the buildings,” he explained. To tie into the façade design, 19 500 Natural Earth 65 mm pavers were chosen, while 73 mm De Hoop pavers were used to connect the design with the rest of the Century City sidewalk specifications. A herringbone pattern was used for all paving to handle the constant movement. He said the entire scheme has been conceptualised as an urban anchor, providing the type of modern architecture that prioritises the urban realm of street and square for pedestrians, rather than vehicles. In addition to its modern architectural style, the Century City Square scheme is being submitted to the Green Building Council of South Africa for a Green Star rating and is in fact a pilot project for a new mixed use rating tool. Corobrik Western Cape Manager, Christie van Niekerk, said the use of facebrick in this iconic development proved the product’s qualities of durability and aesthetics. Van Niekerk said, in addition, the thermal qualities of facebrick further augmented the development’s environmental elements as it negated the need for artificial heating and cooling. He said the colour-fast, skid quality also ensured a year-round ‘new look’ while keeping pedestrians safe.